Comical Interlude » Archive » Why’ve You Ever Forgotten Me? Why’ve You Ever Forgotten Me? 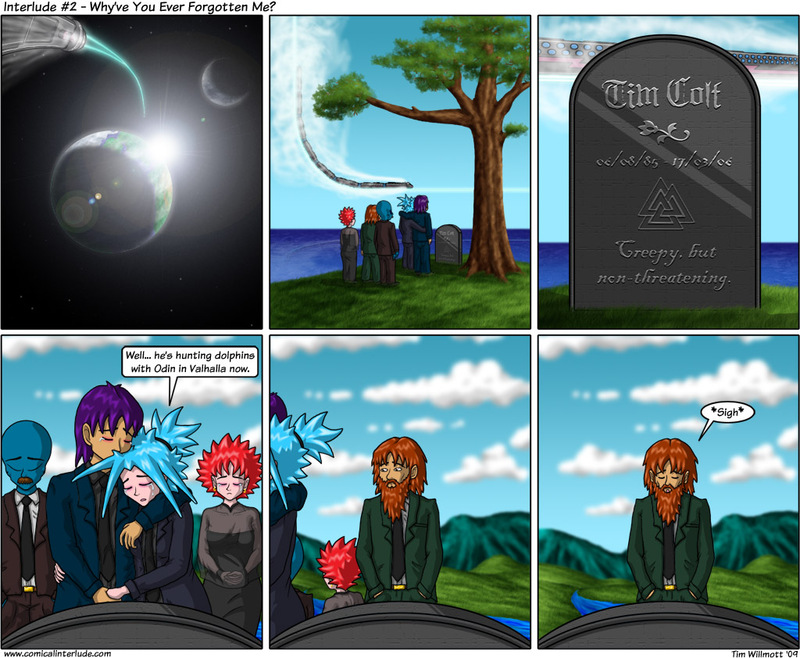 Yes, this comic starts out in 2006 AD (the specific date of Tim’s “death” being the day I drew the first comic that started this whole deal). But it will quickly catch up to the present day, once I’ve reused all my old comics about past events which are no longer topical. I’m hoping to time it so that I’ll be drawing comics about the ‘Ya invasion of Earth at the same time as the real-life alien invasion is taking place (I have foreseen this event). Also, as you can see, it is set in an alternate universe where space trains have already been invented. Crazy Trivia Fun Fact: I was originally going to call this comic “Still Day Beneath The Sun”, because obviously that is the premiere funeral song available today and also it has “sun” in the title, but I eventually decided that the ironic use of lyrics from Blind Guardian’s Valhalla was just too perfect to pass up (it’s a song about Christianity superseding pagan religions, in case you didn’t know).